Not all courses are available in any given year. The Postgraduate Diploma in Social Service Supervision offers an advanced qualification for professionally qualified social and community workers and other social service professional supervisors. The programme is intended for those who have achieved a high level of professional competence and are currently supervising social and community work practitioners and/or social work students on fieldwork placements. The diploma is designed to assist you in developing and defining a personal model of supervision relevant to the practice context you work in. You will be introduced to selected theories and models of professional social service supervision, followed by more in-depth exploration of the administrative, educational, and clinical functions of supervision. Assessment is designed to be immediately relevant to your role as a social service supervisor. 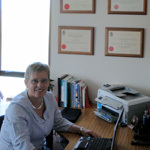 I completed my Bachelor of Social Work at Massey in 1992 and loved it so much that I came back for more – completing the Postgraduate Diploma Social Service Supervision in 2009 and a Master of Philosophy in 2012. My experience at Massey for all three qualifications was fantastic and I attribute my first experience there to unleashing my passion for learning. I loved the Palmerston North campus and the course content, calibre of teaching and learning support was excellent. I chose Massey due to its great reputation. It offered the specific programmes that I wanted and there was the option to do courses via distance learning. The programmes that I completed have all been challenging, inspiring, exciting and comprehensive. The best part about studying at Massey was the excellent resources available to students, including the creche. I chose social work as I enjoy working with people, and in particular, empowering people to achieve their potential. I have had a really interesting career since graduating from Massey, working in the fields of general health, mental health, addictions, and child protection. Finding a job in social work has consistently been easy, both in Aotearoa/New Zealand and Australia, and I believe having a Massey qualification has enhanced my ability to find work. I am currently in private practice, which I have been involved in for the past eight years. The knowledge and skill base I require for this has predominantly been developed through the programmes I undertook at Massey and the employment opportunities that arose from this. In this practice I provide various aspects of social work, including counselling, advocacy, mediation, brokerage and supervision. My advice is to maintain a reflective stance in your learning and practice. I believe a commitment to lifelong learning and development, together with the ability to be flexible and adaptable, is central to a successful and fulfilling career. This diploma is an advanced qualification in Social Service Supervision. It provides opportunities for employment in a wide range of environments, including social services, private practice, management, and consultancy. Many people who undertake this diploma are already employed in the area of social service supervision and use this qualification to enhance their professional competence.